Priscilla Currie, 28, suffered serious injuries after her motorcycle collided with a car in Bloomsbury. A passer by called 999 for an ambulance. A motorcycle paramedic, cycle responder and an ambulance crew were immediately dispatched by the London Ambulance Service control room. Minutes later ambulance staff were on the scene and assessing Priscilla’s condition. She had suffered severe leg and arm injuries and was in a lot of pain. 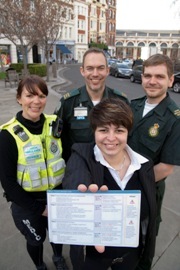 Having initially attended and administered pain-relieving drugs to Priscilla, the ambulance staff used a clinical assessment tool and confirmed that Priscilla was suffering from major trauma. The ambulance staff determined that she would get the best access to assessment and treatment at one of London’s major trauma centres, rather than the local emergency department which was nearer. Using a designated channel on their radios, the staff reported back to the clinical coordination desk in the control room, who in turn informed the major trauma centre at the Royal London Hospital in Whitechapel that a patient would be arriving shortly. The ambulance crew took Priscilla directly to the major trauma centre using blue lights and sirens. Once at hospital, Priscilla was handed over to a dedicated team of waiting clinical experts, who immediately started further care.